JAMB will not be using the POINT Based system to offer admission instead provisional admission would be offered to candidate based on Merit, Catchment and Educationally less developed states. Candidates will then be invited for a screening exercise which will NOT require and POST-UME test in any form whether written (PPT), oral or electronical (CBT). However, the candidate is required to come along with his/her WAEC, NECO or NBTE SSCE or Advance Level result as this will be used for verification and clearance. The JAMB point system is the new system in which Nigerian Universities and all tertiary institutions in the country would use to grant provisional admission to successful UTME candidates, after which they will then be invited for screening. Therefore candidate who are seeking admission into tertiary institutions in Nigeria are advised to carefully study the new point systems carefully as this new system is being used to replace Post UTME screening exercise. SEE ALSO: Possible Questions From New 2017 Jamb Novel "In Dependence"
The New JAMB Point System is calculated using the candidates O'level result and UTME score. This means candidates who passed their WAEC or NECO once without combining results have 10points and also have a better chance of admission. Also note that each ranges category contains five JAMB results per point. 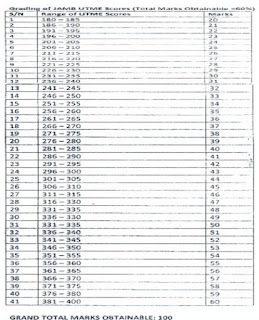 For example a candidate with 180-185 gets 20 points, while a candidate with 186-190 gets 21points. According to JAMB, candidate who are offer provisional admission and are invited for screening will still have to pay for the screening exercise that will hold in their various institutions. SEE ALSO: LATEST UPDATES On JAMB 2017.